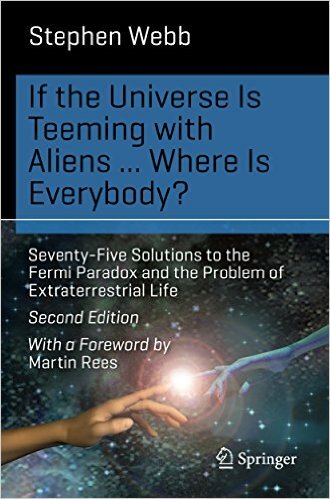 I can honestly say that if Stephen Webb had continued in this vein and had written a book about the Fermi paradox and its possible solutions in the same narrative style as his chapter on Fermi and the origins of the paradox, I would have given this book four to five stars. That chapter demonstrated just how well Webb can write. But the format of 75 'different' solutions lets him down. By about the 12 mark, the whole thing was getting a trifle samey. And by solution 20, I was skip reading, searching for interesting bits. The book has a lovely range and covers many fascinating topics - for example, it went from Bayes' theorem to stone axe manufacturing in a few pages - but the constant return to yet another solution to the Fermi paradox gets, frankly, boring. Structured as a continuous narrative, the content of this book would have been excellent, but as 75 bitty 'solutions' it just doesn't work very well. This proved particularly irritating when Webb goes through all the different reasons why life could be rare in the universe, and says at the end of each, over and over variants on 'but of itself, this is probably not enough to justify the conclusion.' I found myself wanting to throw the book against the wall and scream 'But why should it be taken by itself? Why not combine the solutions?' .... And then Webb cheats and does exactly that in his own 'solution', number 75.